If it’s possible to have an exhibition that’s baffling and illuminating in equal measure, it’s probably this one. The Royal Academy’s vast and rich survey of Soviet art in the aftermath of the October Revolution, ending in 1932 on the cusp of Stalin’s purge of avant-garde artists, gives us a fascinating account of history. 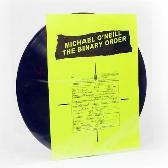 It shows us how its various players – its painters, writers, poets, sculptors, as well as its minor officials – were caught up in the unfolding of seismic events, but it largely steers away from the story of Revolution and abstract art with which we might be familiar – and with which we’re familiar with good reason. Revolution: Russian Art is therefore not a celebration of great art removed from its political context. Rather it’s about the politics in its grand historical sweep illuminated by the art and the artefacts of the time, including posters, ceramics, food coupons, a stray restaurant menu even, and propaganda film footage extolling a land of plenty when the reality was routine starvation, hard labour and the gulags. Just hark how those kolkhoz men and women grin their broad white grins against the bright horizon and the golden fields as they herald the arrival of a brand new tractor. Here’s Vera Mukhina’s 1922 bronze Flame of the Revolution, an homage to Bolshevik party official Yakov Sverdlov, holding a torch aloft, rendered in a heavy cubist-futurist style. Mukhina later became the premier female Socialist Realist sculptor under Stalin, making the triumphal Worker and Kolkhoz Woman for the 1937 Paris World Fair, where it faced down the Nazi Pavilion. Beyond it are portraits, plentiful in number, of Lenin and Stalin. 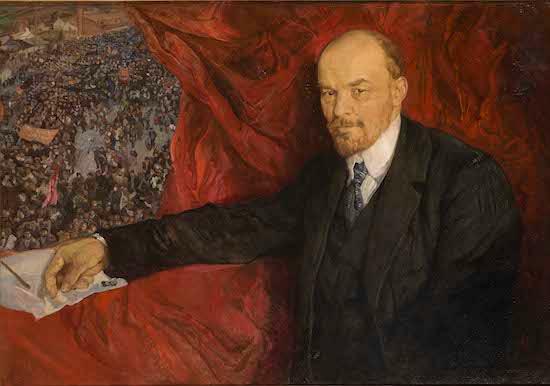 Isaak Brodsky’s Lenin in Smolny, 1930, was painted six years after the Bolshevik leader’s death. Here, in Brodsky’s 19th-century realist style, Lenin appears as a figure in shadow, his face half turned away, quietly signing documents while seated on a dust-covered armchair that faces another dust-covered armchair left empty. A stark, sombre portrait indeed – quite unlike Brodsky’s 1919 painting that shows the bright features of a steely but relaxed leader against plush red drapery parted to reveal flag-waving crowds below. You’d never know a civil war was raging. And I’m particularly taken with Georgy Rublev’s portrait of a wily, gimlet-eyed Stalin, looking up from his copy of Pravda, marooned against a sea of Matisse-red. A bendy dog, swooping like a floating, boneless creature in a Chagall painting, can be found by Stalin’s tiny feet, with the feet attached to short, bendy legs that might belong to a hand-puppet. Not surprisingly, this painting was never exhibited in public during Stalin’s lifetime (and not actually until after the artist’s death in 1975). At this point, I’m wondering if Trotsky will get a look-in, but he never does, purged not just from Stalin’s censored accounts, but, curiously, from this exhibition – like much of the avant-garde art that proliferated during the first few years of Bolshevism. The decision of the RA curators to take as their starting point a sprawling 1932 exhibition, presented in thirty-three room at the State Russian Museum in what was then Leningrad, and orchestrated by art critic and curator Niolai Punin (who himself died in a gulag sometime later, condemned for publicly questioning the officially sanctioned style of Socialist Realism), means that there’s much to ruminate over, though a sense of imbalance prevails. We get a recreation of a gallery devoted to Malevich, Suprematist compositions jostling with conical figures of doughty peasants, but then we get an even bigger section of space devoted to the very little-known (at least in the UK) paintings of Kuzma Petrov-Vodkin, the walls of a whole gallery hanging with still-lifes and figure paintings heavy with semi-mystical or quasi-religious symbolism. 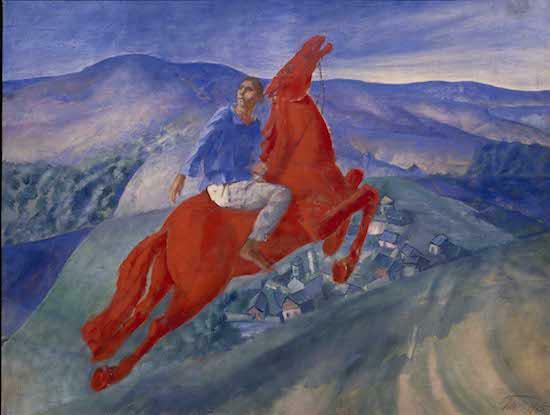 Like many of artists in the exhibition, Petrov-Vodkin, who trained as an Ikon painter, harks back to Russia’s past, and one example of the ideological conflict between Russia’s past and its uncertain future is his rearing red stallion in Fantasy, 1925. Across mountains and hills, the powerful horse surges blindly forward, while the rider turns his head to gaze at the path departed. Portraits, both painted and photographic, are used as a way to tell the stories of some of the Revolution’s most public cultural victims, those sent to the gulag or those who simply had to bend to the will of the Soviet system, such as Sergei Prokofiev, who was forced to compose works glorifying Stalinism. Others, such as the experimental theatre director Vsevolod Meyerhold were executed. The great poet Anna Akhmatova, whose portrait Petrov-Vodkin painted in 1922, suffered the imprisonment of a son and the loss of two husbands, the first executed, the second, Punin, the curator whose exhibition is paid homage to here, died in a camp in Vorkuta. 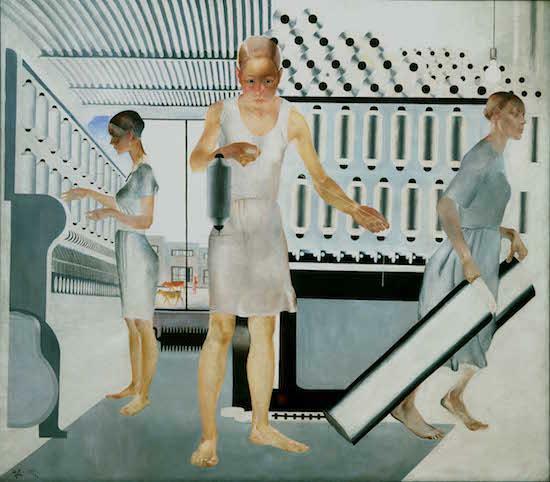 As much as we associate the Stalinist period with bad art – and there was of course much that was bad – there are those gifted artists who managed to combine Socialist Realism with a light modernist sensibility. Alexander Deinka was among the most gifted, and his paintings of athletes are surprisingly sensitive. So too is his best known work, The Defence of Petrograd, 1928, which looks back to the height of the civil war, October 1919, when the White Army had reached the city. Moscow was prepared to let the city fall. Trotsky, however, decided to prepare for its defence. Frieze-like, we see exhausted soldiers trudging across a platform on an upper level, but below, striding in the other direction, are the sturdy workers who’ve been newly armed and are ready to die for the Soviet state. It’s fitting, however, to end with a black box marked Room of Memory, which quotes Akhmatova with the words “No generation had a fate like that in history”. Here we quietly sit through a poignant rollcall of names and photographs of those arrested during Stalin’s Great Purge. We learn of their fates. Some survived, many didn’t. 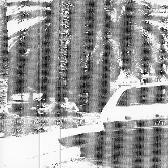 Some were freed, only to be rearrested later and executed. The mood as you leave is sombre. Since Building the Revolution: Soviet Art and Architecture 1915 to 1935, the RA’s knock-out, celebratory exhibition of 2011, perhaps there is less of a rush to overlook all context in order to simply elevate the aesthetic.